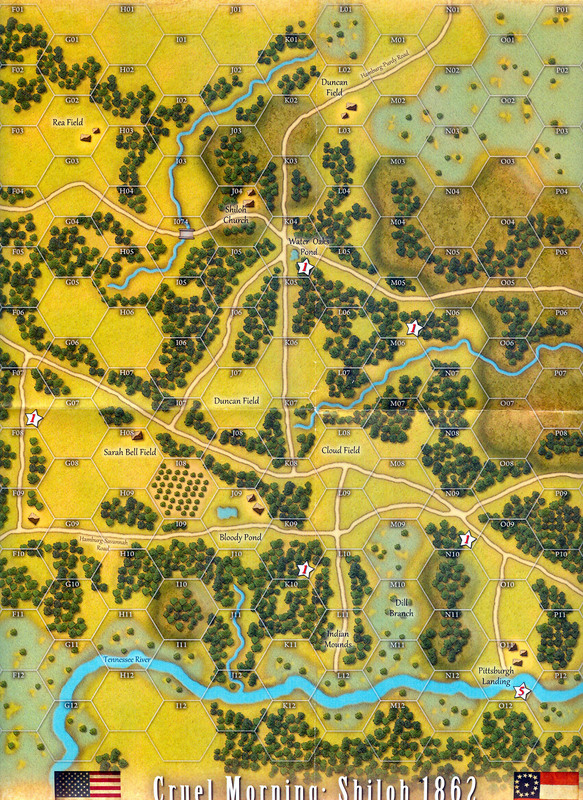 The map by Jose R. Faura is impressive, and definitely the best and most effective of the components. It is a thing of beauty, evocative of the period, and without terrain ambiguity. The counters unfortunately do not measure up quite as well. The worst fault is that much of the printing is illegible, in particular unit designations. 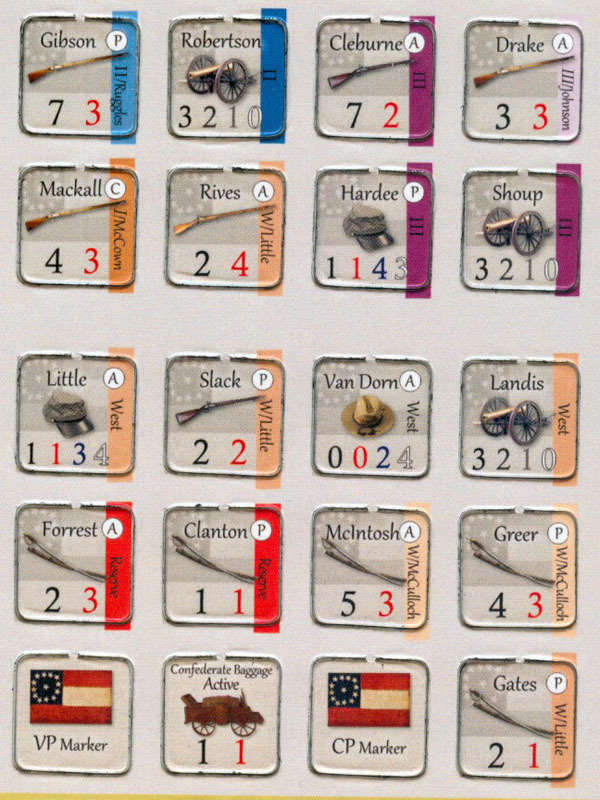 This type is small, and the dark lettering against dark background does not produce enough contrast, especially on Confederate counters. Further, while the muskets and kepis for infantry and leaders respectively work, cavalry is designated by an unsheathed sword and scabbard that looks too much like a quill pen. Maybe under ideal lighting conditions and with youthful eyes, the counters would function better, but not many wargames have either. 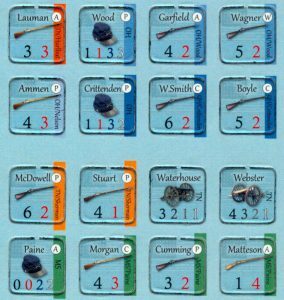 The back of the rulebook features a complete unit manifest, with counters organized by division and, for the Confederates, corps. However, the graphics here are even smaller than on the countersheets, and what was illegible there is little more than a clue here. 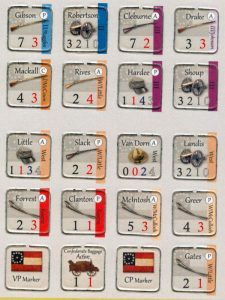 The most important benefit of this player aid is to let the gamer know how many units should be in each organization, as determining what they are precisely are happens to be virtually impossible. The system is unique. Players roll the dice to determine initiative, with the one with the higher modified number going first. 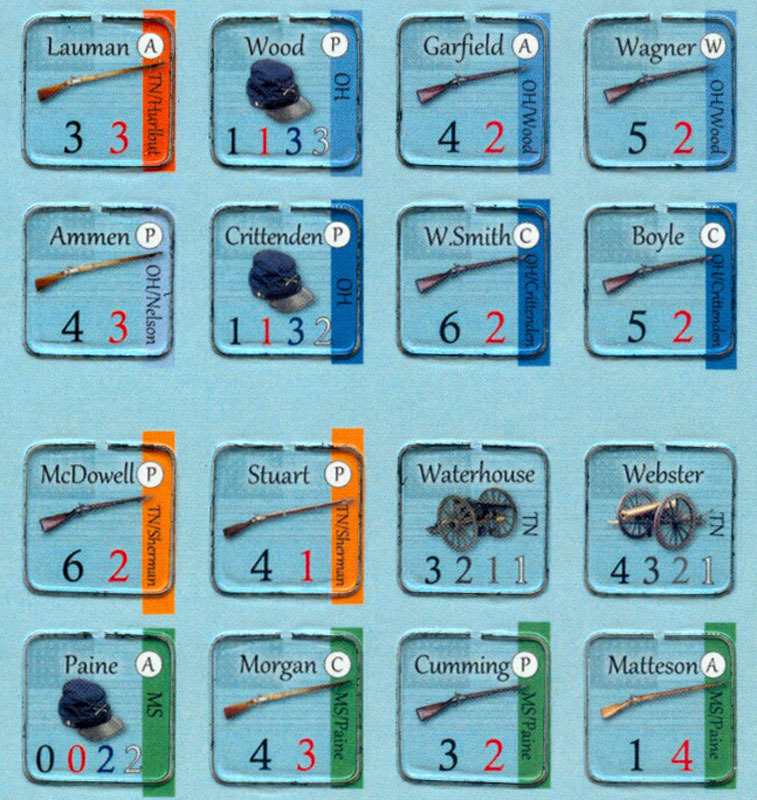 In the even of a tie, the players roll against a random events chart. Players then conduct artillery bombardment, then the phasing side activates and his moves his units, followed by combat. This sounds much easier than it is in practice. The reason is that everything is dependent on die rolls. Players are assigned activation points which can increase or decrease based on the presence of overall commanders or casualties. They are also subject to modification by a die roll. Further, reinforcements can be delayed by die rolls. This might be the most appropriate use of a die-happy approach, but still, with all the other randomized factors, its value is liable to be lost amidst the lesser ones. The combat system is overly complex and is, again and no surprise, dominated by multiple die rolls. Basically, everything in combat is based on the Quality Check, in which one rolls against the unit’s quality rating. Gamers should be familiar with the concept, better known as a morale check, and as with other games employing this mechanic, high rolls that exceed unit quality result in failure, while those equal to or lower than the quality rating are better. If the roll is lower than the quality, then the unit is unscathed; an equal roll results in a one-hex retreat. One higher than this number suffers a step loss. The basic problem is that the system is far too complex and time consuming. First, non-phasing units about to be attacked conduct defensive fire against one attacker, calling for a quality check of the target. Then comes combat itself, with a quality check for each participant, modified for combat odds, terrain, leaders, and other factors. This is more confusing than it should be, as about half the modifiers are odds column shifts, which yield die roll modifiers, and the rest are die roll modifiers in their own rights. All in all, it is confusing, clumsy, and ultimately frustrating. Perhaps even worse, it forms a major distraction from the core mission of paying attention to tactics and fighting the battle. 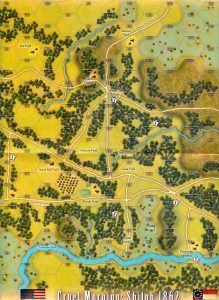 Artillery and Union gunboats are not represented in the game by distinct units, as are infantry and cavalry. Instead, they are semi-abstract assets can be placed for bombard or combat support. 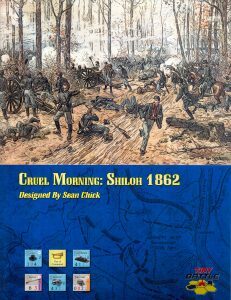 This works better than the basic combat system, with morale checks for one and all, but is more applicable to twentieth-century combat than in a Civil War battle. The core, essential problem with Cruel Morning is that what should be made simple, is instead made unnecessarily complicated. The combat system is the most conspicuous example; it adds complexity upon complexity, and die roll upon die roll, for no real benefit. 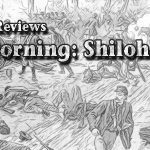 Most game systems can accomplish the same thing with a single roll of the die or two dice; the Civil War, Brigade Series (The Gamers/MMP) is a notable exception, using a complex system to yield a nuanced range of responses affecting both unit strength and cohesion. 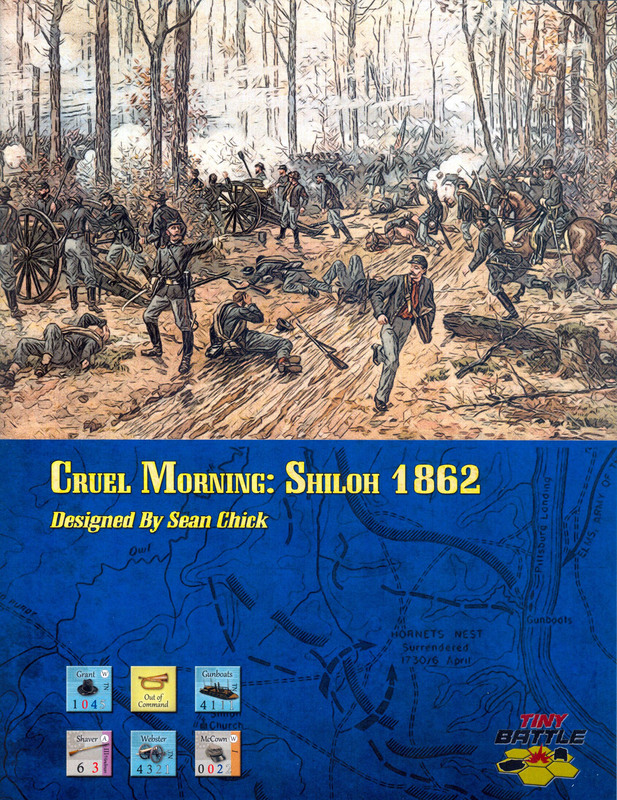 But Cruel Morning gives far less reward for its work; what its combat system accomplishes with its endless quality checks could have been achieved with a simple, standard, odds-based combat results table. Had this game yielded more return for its convoluted design philosophy, then the players’ investment in time, effort and head-scratching might have been worth it.